Freelancing is the most popular profession nowadays. The trend of outsourcing has lead to the emergence of freelance web designers who take projects independently without remaining under the influence of any organization. Many think this is the easiest way to work independently and make money. But diving into the pool of freelancing needs a proper planning and the mentality of being committed to your work. It sounds very thrilling to work on your own, but no restriction, no time limit basically drifts a person apart from disciplined lifestyle. You cannot decide correctly- If you have a tendency to remain confused on your decision becoming a freelance web designer could be a problem for you. Sometimes one has to take hard decisions, for example, agreeing on a project which has a low budget, but the project can make your portfolio really impressive. A person will eventually stand between two decisions, and face times when it had to decide which way is the best way. So if you are fickle minded it is better to stick to a 9 to 5 job where someone else takes the major decision. Being spontaneous-Being spontaneous can be an advantage for some, when you are required to take quick actions, but sometimes being a quick decision maker leads you to a pitfall and nothing else. As you are all alone, no one is there to suggest you or help you take a wise decision so its better to take time before finalizing a project. A decision decides the amount of time, hard work or creativity is required for a web design project and the budget if it’s really worth it or not. If you want to earn money easy way- Many people think that freelancing is the easiest way to earn money, but forgets to determine the hard work required to earn that position. So if you think you can become a freelance web designer without the hard work, you are highly mistaken. Yes, it’s not a myth that freelancers can earn huge amounts in a week or a month, but before reaching that position one needs to establish him/herself as the most preferred freelancer. You don’t have a strong portfolio- If you really want to leave everything and make freelancing as your main source of income, it is recommended to build a strong portfolio first. Build something that will help people pick you for outsourcing their web design projects. A strong portfolio helps to describe your capabilities as a web designer, your work will speak for your candidacy. Thus, make a profound portfolio, which helps to make you different and unique from the other freelancers who are ready to work. You don’t have a proper financial plan- The first thing you should learn by heart is that freelancing isn’t a stable profession, it has many ups and downs. One day you may get 5 projects and on the other day you may be left empty handed. So it is advised to jump into the freelancing business only if you have some savings to survive without projects for some days. You cannot just expect flush of money the moment you start off as a freelance web designer. If you are willing to depend on freelancing to fill your plate, you should probably back off. Your designs depend on software- Web designing is all about imagination and creativity, if you don’t have any knack for designing you can never become a successful freelance web designer. Clients pay for the idea, anyone can take the help of softwares and make changes to the design, but making a design from the scratch and adding a new definition to it needs creativity and out of the box thinking. So if you are not in love with art you cannot produce innovative and unique designs for long. You have poor communication skills- Freelancing is another name of one man force. A freelancer handles everything starting from project bidding, to project confirming, accounts, negotiation, everything. So a person who is good in terms of talking has greater advantage here. It’s not about making great web designs, but convincing the client, making them agree with your work and idea, is another job description of freelancing. You are not punctual– There is no one to shout at you and remind you the deadline, it is all about you, so managing different projects simultaneously and finishing them within the deadline is very crucial. It’s not only about submitting projects on time, being punctual overall, for example, being a freelance web designer, it gives you the freedom to take leave and stop working any moment, it is the determination to finish a work on schedule which actually helps to maintain a healthy freelancing career for long. You are not so committed – Commitment is the key to success in a freelancing career. First, it is important to remain committed to yourself and your work. A number of situations will arrive when your commitment will be questioned, for instance a client may make you rework on a project about 10 times, a client becomes very difficult to please, you don’t get your payment on time, etc. Remember you alone has to handle all this situation while keeping calm. 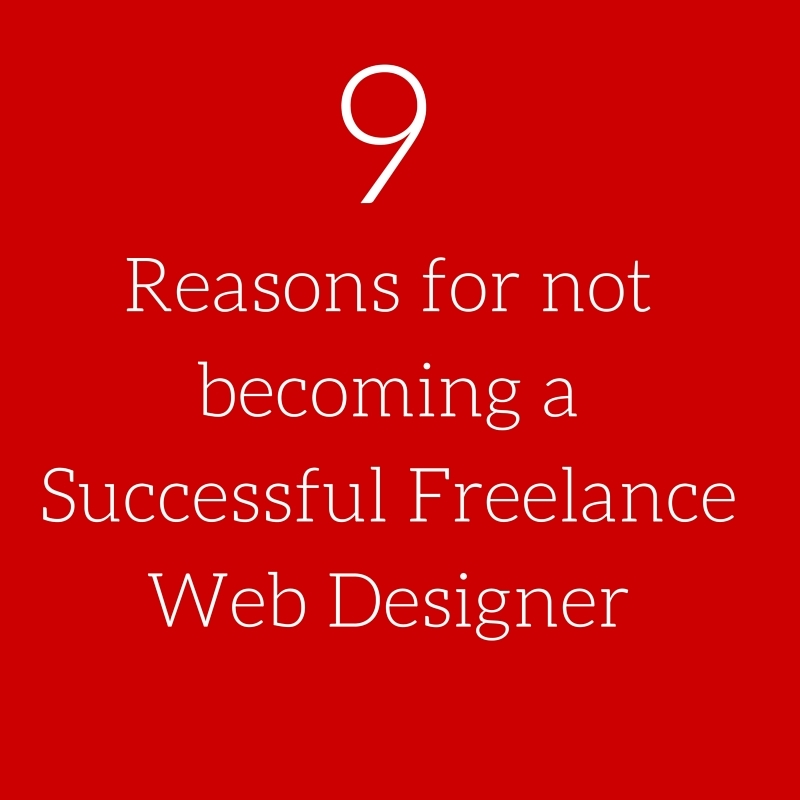 So, now you know what can probably become an obstacle in becoming a successful freelance web designer. So think wisely before deciding whether you really want to take a freelancing career or not.